Want to buy printer where the cartridges dont cost an arm and leg.? I am fed up with paying almost as much as the printer cost just to reniew the ink cartridges. Does anyone know a printer with cheap cartridges (I only need black and white) or ones you can re-fill with ink? Best Answer: With the cost of the printers dropping down to ludicrous levels (Color Laser Printer sub $250 at Staples) it is getting harder and harder to find a printer that is more expensive then the ink/toner is. Your best bet is to ignore the cost of the printer and the ink and look at the cost per page. For example my laser printer (Black and White) cost me $200 and came with a 3,000 page rated toner cartridge. That's a cost per page of 6 cents. The additional toner (High Capacity) is $125 for 8,000 pages. So when I bought the printer I also bought that cart at the same time. So in effect I paid $325 for everything and I'm getting 11,000 pages at an average cost of 3 cents per page. Buy another toner when they go dry and now I've invested $425 and have gotten 19,000 pages of printing at a cost of 2.3 cents per page. So you can either drive yourself nuts with the fact that you are going to be spending more on the ink, or you can look at the cost per page over the life of the printer which are more friendly numbers. And if you only need black and white printing, consider a laser printer. Ink Jet printers often have carts costing $45 and only give you 250 pages at best. This is a cost per page of 18 cents. Laser and Toner is far cheaper than inkjet. A laser printer costs far less than an inkjet. More expensive one costs less to run. 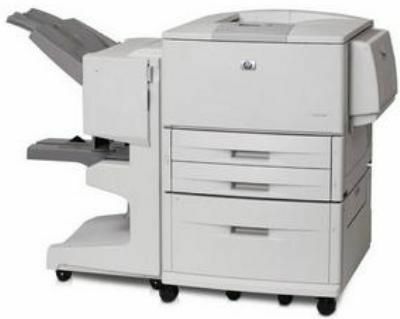 This is (still in production) Laserjet 9050dn (with the multifinisher attached on the left - it staples and makes booklets, and extra "tray" on the bottom of the printer). The toner (one piece) costs $150 to $250 depending on where you buy it, costs 0.5 cent per page to run. Each toner lasts 30,000 pages. Source(s): Have one. Bought it in November of last year, use it heavily - the original toner has not run out. Try Kodak for Printer and reasonably priced inks. Alternatively take your used ink cartridge to Cartridge World and refill them for pennies not pounds. By far the best available is the Kodak line of printers. Amazing text, lab quality photos and best of all the replacement ink is about half the cost of competing brands. I bought one and have been very satisfied. See link below. For cheap cartridges you can enjoy 6% off all Lexmark ink cartridges at this site http://www.everydaysale.co.uk/shop-merchant_id-2913-discount-voucher-123-Ink-Cartridges.htm. If you log on EverydaySale.co.uk which is a site full of discount information now and you will get £100 Cashback or free 3 Year warranty with Brother DCP 9010CN printer at http://www.everydaysale.co.uk/shop-merchant_id-6232-discount-voucher-TECHDEPOT.htm. I hear they only charge a nail and an eyelash down at the fish market. What's the point of buying new printer cartridges when you can just buy another printer...? Where can I buy printer cartridge for Epson Stylus c86? Can anyone reccommend a 3 in 1 printer, reasonably priced, and that the ink cartridges dont cost the earth,?